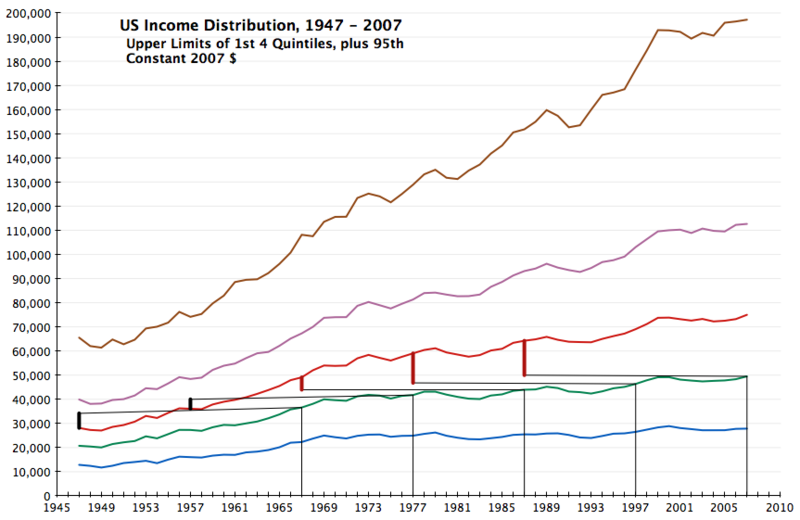 These are the upper limits of the 4 bottom quintiles of the U.S. income distribution by year starting in 1947, along with the upper limit of the 95th percentile. If you were at the top end of the 60th percentile in 1947 (the red line) and by 1967 you had dropped to the top end of the 40th percentile, you were still doing better. The same is true comparing 1977 with 1957, but not if we compare 1987 with 1967, 1997 with 1977, or 2007 with 1987. Starting roughly in 1970, what we see is that the upper limits of the 80th and 95th percentiles grow more quickly than do the upper limits of the 60th and 40th, while the 20th is essentially flat. What this means is that if you were dropping in the income distribution after 1970, from 60th to 40th, over a twenty year period, you were not doing better anyway. To put this the other way round, from the 40s to the 70s, people staying at the 40th percentile were doing better than were people at the 60th percentile twenty years before. After 1970, not. This pattern in the U.S. income distribution doesn’t answer any fundamental normative questions. But it does help explain how someone like Hayek could have been a bit sloppy in his discussion of principles of social justice – how, for example, he could move very quickly from talking about inequalities benefitting all to maximizing the overall level of opportunity to maximizing overall (i.e. total) income. It doesn’t matter (as much) what exactly is the right principle of distributive justice if all reasonable principles suggest that the current system is better than any other feasible system. Before 1970, it was at least plausible that that was the case. After, not so much. For more on this issue, see the lecture I recently gave on Hayek and Rawls. Next Next post: Public Reason vs. Social Justice?